An artist's illustration of the Thirty Meter Telescope (TMT) atop the volcanic peak of Mauna Kea in Hawaii. The construction phase of the TMT project officially kicked off on Oct. 7, 2014; the telescope's "first light' should come in 2022. An enormous next-generation telescope that could transform astronomers' understanding of the universe is now under construction, to the consternation of some protestors. The building phase of the $1.4 billion Thirty Meter Telescope officially kicked off Tuesday (Oct. 7) with a groundbreaking/dedication ceremony near the top of Hawaii's Mauna Kea volcano, though the event was delayed several hours, apparently by people blocking the road up the mountain. But construction activities on TMT — which is just as big as its name suggests — remain on track, and the telescope should begin observing the heavens in 2022, project representatives say. "This is an exciting moment as we begin construction of TMT," said TMT International Observatory Executive Director Ed Stone, a researcher at the California Institute of Technology (Caltech) in Pasadena and the project scientist of NASA's Voyager mission, in a statement. "Its giant mirror, nearly 100 feet across, promises the highest definition views of planets orbiting nearby stars and the first stars and galaxies in the distant universe." This artist's concept shows the Thirty Meter Telescope at night, with the laser guide star system operating. TMT will link up 492 small, hexagonal mirrors to form one giant light-collecting surface 98 feet (30 meters) across. When it's up and running at full strength, the telescope should deliver about 10 times the resolution of NASA's famous Hubble Space Telescope, TMT representatives have said. The scope will employ an advanced "adaptive optics" system to cancel out the blurring effects of Earth's atmosphere. The huge observatory should help researchers discover and characterize exoplanets, investigate the nature of mysterious dark matter and dark energy, and learn more about how the universe's first stars and galaxies came together, among other things, project representatives have said. 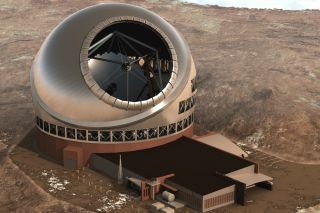 TMT's technology is based on the twin, 33-foot (10 m) Keck telescopes, which also sit near the top of Mauna Kea. "The technology is not risky for TMT," TMT board member Shri Kulkarni, director of the Caltech Optical Observatories, told Space.com. "That has been demonstrated with Keck. Now, it's a question of scaling up." Developing and implementing TMT's instruments — which will include three different spectrometers, as well as additional gear to be chosen as the project moves forward — will present more of a challenge, Kulkarni said. But the toughest tasks of the entire TMT effort have been logistical rather than technical, he added. The most challenging aspect is "building the financial and political partnerships. That's the case with all large projects," Kulkarni said. "It's a fairly big logistical thing. Countries have their own timetables and their own way of doing things. All the astronomers have to agree to work together. That takes some time." TMT is an international collaboration involving Caltech, the University of California, the National Institutes of Natural Sciences/National Astronomical Observatory of Japan, the National Astronomical Observatories of the Chinese Academy of Sciences, the Association of Canadian Universities for Research in Astronomy, the Association of Universities for Research in Astronomy and the Indian Institute of Astrophysics. In the coming decade, three enormous telescopes - the Giant Magellan Telescope, the European Extremely Large Telescope and the Thirty Meter Telescope - will come online. See how they stack up in this SPACE.com infographic. TMT isn't the only giant, ground-based telescope scheduled to come online in the early 2020s. Two others will be built in the Chilean Andes: the Giant Magellan Telescope (GMT) and the European Extremely Large Telescope (E-ELT), which will boast light-collecting surfaces 80 feet (24 m) and 128 feet (39 m) across, respectively. Each of these observatories aims to tackle the biggest questions in astronomy. There's definitely room for all three of them, provided they all get built, Kulkarni said. "My prediction is that each of these telescopes will have different flagship instruments," he said, citing the high cost of instruments for big observatories. "They'll have some common workhorses, but they will distinguish themselves in having different flagship instruments."